7:40 a.m. — A person was stopped on the 400 block of Crown Point Circle. 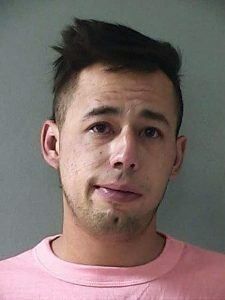 A person was arrested on charges of failure to appear. 10:23 a.m. — A caller from Rockwood Drive reported a car parked in a handicapped parking space for the last week. Contact was made with the office manager who said it was her vehicle and she didn’t have a handicapped placard and was moving the vehicle. 10:47 a.m. — A caller from the 600 block of Minnie Street reported a man watching people from the bushes. The caller was concerned because there was a group of children nearby. Officers made contact with several people and nothing suspicious was seen. 12:12 p.m. — A caller from the 400 block of Central Avenue reported a man sitting on a bench by the playground staring at the caller’s children. The caller’s husband confronted him and he got hostile and refused to leave. 1:41 p.m. — A caller from the 2000 block of Nevada City Highway reported people who had tried to steal from a grocery store earlier had just walked into a different store and tried to steal. An arrest was made on charges of being under the influence of a controlled substance. 3:13 p.m. — A caller from the 1100 block of Sutton Way reported a vehicle parked in employee parking. The caller said there were six people associated with the vehicle and they’ve asked them to move along with no luck. 4:56 p.m. — A caller from Crown Point Circle reported walking his dog and found what appeared to be a body wrapped in sheets off to the side of the road. Officers found a blanket but no body. 6:06 p.m. — A caller from the 100 block of East Main Street reported waiting for a ride and a man approached her asking if she had drugs and then asked if she was waiting for a bus and then made lewd comments to her and then tried to steal her purse. 6:26 p.m. — A caller from Kidder Cemetery reported walking in the area with her daughter when a vehicle with a man and woman inside pulled up. The caller said her daughter was approached by the couple and asked questions, then they drove off. The caller said they appeared to be arguing and she could hear the man asking the woman “should we do it, should we do it?” The woman yelled “no” and the man drove by the caller and said “I guess you can have a happy Mother’s Day now” and the vehicle drove off. A report was taken. 12:01 a.m. — A caller from the 300 block of West Main Street reported a man at the door thrashing around on the ground and throwing his arms around. Officers found the man was fine. 2:11 a.m. — A person was stopped on East Main Street. A person was arrested on charges of driving under the influence. 4:27 a.m. — A caller from Shana Way reported theft out of an unlocked vehicle. 4:57 a.m. — A caller from Alice Way reported tools taken from a garage. It was unknown if the rollup door was closed. 5:12 a.m. — A caller from Lawrence Way reported a vehicle was gone through but the owner didn’t store anything of value in it and didn’t know if anything was stolen. 7:59 a.m. — A caller from Beeman Lane reported a woman sitting at the end of her driveway yelling and hitting herself. The caller believed the woman was on drugs. 8:02 a.m. — A caller from Sunset Way reported her daughter’s vehicle was broken into the previous night and a purse was stolen. 10:04 a.m. — A caller from Wolf Mountain Road reported his son was throwing things at the dump. Another caller reported her ex husband was falsely accusing her son to the police. 10:53 a.m. — A caller from Lawrence Way reported items taken from an unlocked vehicle. 2:56 p.m. — A caller from Wild Life Lane reported a neighbor’s eight to 10 small goats were out near a road. The caller said it was an ongoing issue with the neighbor letting the goats run at large. 9:16 p.m. — A caller from Via Vista reported being the neighbor of someone who was out of town and just heard tapping, heard a side gate open and close and saw a flashlight. Officers found the residence secure. 9:40 p.m. — A caller from Lower Colfax Road reported someone just walked through her property and ducked out of the way when the caller saw them. Officers were unable to locate the person.